Do you work at Davids Deli? 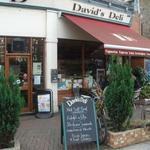 What did you think of Davids Deli? We had just moved to the area and had some friends over and decided to check out this shisha bar. Really disappointed with the service we were 5 people but only 3 wanted to smoke but the waiter insisted we had to have a minimum of 2 shishas between the group even though we wanted to order food and drink. Spoke to the manager he was rude and once I spotted other large groups with only 1 shisha he pointed out that they were regular customers. I am not sure how this place has managed to attract returning customers if this is how they are initially treat people. Not to worry though, I will find another more welcoming local shisha bar. On the outside of the restaurant, shielded by a red tent, some people are smoking the water-pipe. Which adds to the Arab/Israeli atmosphere. Two television screens point through the window. We choose to eat inside. The chicken was crunchy, the rice was dry. The Mezze were all served on one plate, to suit the English habit of eating with knife and fork, I presume. The home made fluffy fruit juices are recommendable for desert. Food on whole looked reasonable for a deli, but both of us who had shwarma (the dish which was highly recommended by staff there), suffered food poisoning, were very ill, due to the meat obviously kept at lukewarm temperature. Letter to proprietor ignored; subsequent phone call to venue elicited icy cold disinterest. AND we went with friends who recommended the place! Never again! Absolutely the best breakfasts in London! The most beautiful almond croissants, and excellent coffee. It's not just the quality of the food, but the staff are so wonderful as well...they know all their customers and always have a friendly smile and time for a few words. I occasionally go there for lunch, and the food is all home-made, and well-cooked and well presented...but my main interest is in the breakfasts. 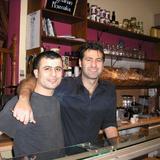 TRY THE ALMOND CROISSANTS!! A perfect start to the day. This little deli in West Hampstead is a very popular haunt amongst many people in North West London serving up sandwiches and Lebanese/Israeli style dishes with a beaming smile. 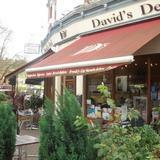 Open since 2004, Davids Deli is positioned at the top of West End Lane in the nucleus of what is West Hampstead’s main high street. The decor is simple and the layout even simpler with an attractive outside area for dining that takes in views of the street and passers by whilst inside the use of Mediterranean colours is reflected in the clientele that frequent here. There’s a pretty mezzanine level that although small is inviting and cosy for a late brunch or a simple coffee and catch-up. The mix of West Hampstead locals blend in to the background with plenty of Israelis and Lebanese alike which make for a vibrant ambiance. However it is the incredible staff that the must be taken off to. The sheer friendliness, care and likeability factor in which they go about their service is impeccable and some more well known venues should take note. In fact you will soon be on friendly terms due to the confident and laid back approach that they take thrown in with some excellent personal service. 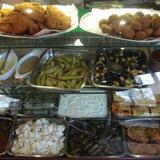 A mixed bag of authentic Israeli and Lebanese cuisine is offered up to hungry diners. The borekas are superb and fluffy. These are spinach or potato turnovers that are traditionally sold in falafel places in Israel. Did someone mention falafel by the way? Well this does not disappoint either, a typical Middle Eastern dish which incorporates crushed chickpeas are served hot and spicy and deep fried. Ask for some pitta bread which acts a perfect accompaniment (that’s if the amazing staff haven’t already brought it to your table with some other treats to try including a well seasoned and balanced spiced potato salad). The chicken schnitzels are another winner. A classic dish taken from Eastern Europe this is a chicken breast taken dipped in egg flour and breadcrumbs and shallow fried in oil. These are fresh and crispy and come with choice of boiled rice or chips or even salad which struggles to compete on the plate with the main highlight. The lamb shwarma is another choice that will have you picking your mouth from off the floor. A typical Middle Eastern dish featuring spit roasted meat which is carefully shaved off which usually composes of lamb or chicken. However this is a literally a cut above the usual greasy offering down the local after an intoxicated fun fuelled night. Tender and moist, this again can be taken with either rice or chips or some creamy slaw. There are the usual offerings at this deli that will certainly not leave you thirsty. Try one of the freshly squeezed juices with apple and orange taking top marks home. There are also some invigorating smoothies too that will also tempt you into submission. An all round fantastic place to while away a few hours it is the highly personable staff that really launch this place above the rest in West Hampstead.